2. Toss butternut squash, leek, red bell pepper, green beans, 2 tablespoons olive oil, 1 teaspoon TABASCO® Sauce and 1/2 teaspoon salt in large roasting pan. 3. Roast until vegetables are browned and tender, 15 to 20 minutes, stirring occasionally. 4. Meanwhile, cook fettuccine as package directs. 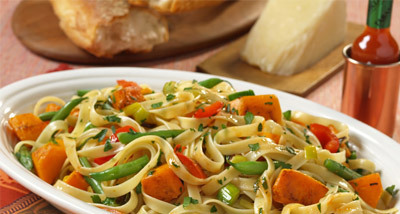 Toss roasted vegetables with fettuccine, 1 tablespoon olive oil, 1/2 teaspoon TABASCO® Sauce, 1/2 teaspoon salt, and parsley in large bowl. 5. Serve with grated Parmesan cheese. Toss salad immediately before serving.